Scobies Retail Clients: Giorgio Armani, Ralph Lauren, Prada, Dolce & Gabbana, Pucci, Basler, Moncler, Valentino, The Bridal Chest, Amelia Wickstead, Polo Ralph Lauren, Christian Dior, Carolina Herrera, Miu Miu and Alberta Ferretti. These International Fashion Houses and Designers use, endorse and recommend our services. 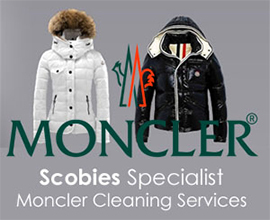 Scobies specialize in dry cleaning delicate, mixed and multi-coloured fabrics, including beading, crystals, sequins and lace frequently used in evening wear. The greatest care and attention to detail is given to hand pressing each garment to produce an immaculate finish. Expert and detailed attention is given to each item, which are re-checked and carefully packed in acid-free tissue to preserve their impeccable finish. We offer a specific Collection & Delivery service for customers from either home or place of work. If you are unable to find the time to take your garments to either one of our branches, please call 020 8693 2754 or email us at scobiesvalet@btconnect.com and we will collect* your items for cleaning and return them in pristine condition.